Uber has suspended its ambitious pilot self-driving project following the crash of one of its autonomous vehicles in Tempe, Arizona. The car in question was running on self-driving mode, but had a driver inside who apparently could not take control of the car before it crashed. 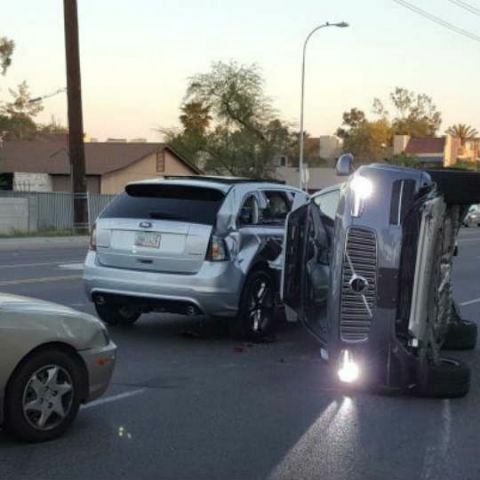 A video posted to Twitter by Fresco News shows the self-driving Uber flipped on its side following the accident in which it ended up damaging two other human-driven cars on the road. "The vehicles collided, causing the autonomous vehicle to roll onto its side. There were no serious injuries," said an Uber Spokesperson. While no human injuries were reported in the driverless car crash, Uber has suspended its pilot testing program for self driving cars in Pittsburgh and San Francisco. The ride-hailing company has grounded its fleet of driverless cars in both places, pending an investigation that has been launched to look into the accident in Arizona. “We are continuing to look into this incident," Uber noted. This is the second time an Uber self-driving vehicle has ran into trouble. Last year in December, another one of Uber’s driverless cars ran a red light in California. While Uber claimed it was a human error, company insiders claimed otherwise. Uber then moved its test programme to Pittsburgh, refusing to procure a permit for its autonomous cars as per California state’s requirements. However, it is not just these snags that are plaguing the growth of Uber’s Advanced Technology Group (ATG), assigned with the responsibility of the company’s driverless project. ATG may be Uber’s golden goose for the future, but the group is also facing multiple internal challenges dwarfing its growth prospects. ReCode conducted extensive interviews with stakeholders in Uber’s driverless project and found disturbing internal tensions among top leadership in the company. According to the publication, many involved with the project think it has reached a “technological standstill.” One of ReCode’s sources also claimed that a “mini civil war” has broken out within the organisation. Attrition rates are also seen growing in the company, as many top executives have quit. At Least 20 engineers have left the company since November, notes ReCode. Even though Uber CEO Travis Kalanik recently apologised for the company’s dysfunctional work culture, the controversy ridden organisation is unlikely to solve all its issues anytime soon as Kalanik looks to appoint the company’s first COO.